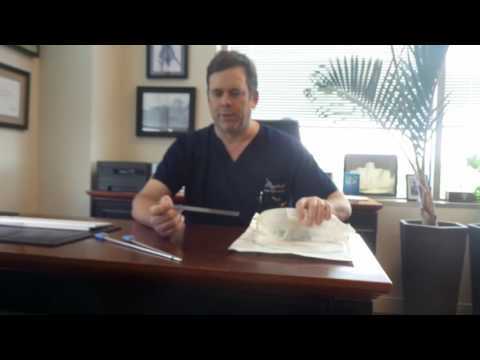 Dr. Mountcastle demonstrating the process of Laser Liposuction. The second step, after melting the fat, is to break it up. You ready? say. We're now going through our second phase as the tissue breakup, which we use a different type of cannula. It's called a exploding tip cannula. We're going to go into the tissue and now breakup all the fat we've already melted with the laser this is the second portion of it where we just go in and you just see, and you just basically go like your doing a windshield wipe where you are just going back and forth from one section to the next like your vacuuming under a couch. You want to hit every spot. You don't want to forget a spot. Then you go there, and then you go back, and then you go superficial, and then you go deep. You go at every level. You can see in the tubing that the fatty tissue's coming out without even any ... We're not even on suction right now. This is just coming out because it's already been liquefied by the laser. Okay? Then we're going to the top. Now we're going to the bra pad here. The bra pad is a little bit more fibrous tissue in it. You're up in here and just breaking up this tissue. You can see that it's a little tougher up here. Got it?